We couldn't visit California without checking in with the Swenson Lennox clan. 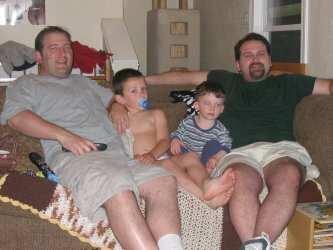 Here we are relaxing with Uncle Mike and Alex. While we were visiting them, I went for a dip in their pool, helped knock down a fence and went to the world's best farmer's market.